Moving into your new home isn't as easy as loading up your old home and moving it into your new one. To help you take care of some musts, check out these moving tips. If you're moving into a new home soon, it can be easy to lost in the excitement and overlook some important steps. For first time homebuyers, it can be hard to know what to expect when moving into a new place. Luckily, Home Key Title has your back. Check out these tips that can help make moving into your new home less stressful. Before even packing up your stuff for the big move, it's important that you remember to take care of some logistical things, like ensuring you receive your mail after moving. You may pay most of your bills online, but you never know what important documents you may receive in the mail. If you haven't taken the time to forward your mail to your new address, you may lose some important mail you didn't even know to expect. To prevent this from happening go onto the USPS website and fill out a change of address form. Do this at least a couple weeks before moving to ensure your don't miss anything important. Not only do you want to be sure you don't lose any mail, you also don't want to be in a new home without electricity or gas. Before moving, call your utilities providers and set up a disconnect date for your current address and a connect date for the day you plan to move into your new home. Having cable and wifi may not be as important as your utilities, but don't forget to also call these providers so that your service doesn't get interrupted. If you have a security system, schedule an installation date for your new address as well. Changing the locks on your new home may not be an obvious step to take, especially if you're a first time homebuyer. 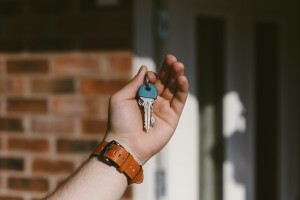 There may be no reason to not trust the previous homeowner, but you can never be too sure how many other people may have keys to your new home. The previous homeowner may have given spare keys to family members or friends while they were on vacation in case of an emergency and then forgotten about it. For safety reasons, it's best to change the locks so that you're sure you know exactly who has access to your home. If you're close to finally getting your dream home, don't let it slip away because of a title issues. Protect your investment with title insurance in Northborough. To get your title search started, contact Home Key Title at (508) 475- 5502. Moving into a new home means getting familiar with a bunch of new spaces and objects. Some items you absolutely need to get familiar with on your first day in the home include the electrical panel and the main water shutoff valve. First up is identifying where both are located. After that, learn how they work in case of an emergency. Everyone in your home should be able to locate these items, as well as the fire extinguishers in the home and different escape routes. Be sure to also test the smoke detectors and the carbon monoxide detectors. You may not arrive at your new home with a full load of groceries, so it can be easy to forget about the appliances. To make sure you don't forget to test these, put them on your to-do list. Plug in the appliances so that you're sure they work and are ready to be used. While you're at it, make some time to test the electrical outlets in the home just in case. If you're still in search of your dream home, you can't be too prepared to make a great investment. Learn how to protect your home investment with title insurance in Northborough by contacting Home Key Title. Get your title search started by giving them a call at (508) 475- 5502.